ABC Open is taking contributions on the topic of “the daily commute”. The deadline for contributions is midday Tuesday 9 June. Suggestions for a fast rail service between Badgerys Creek and Sydney CBD in time for the opening of a future Western Sydney Airport were dismissed by the Federal Transport Minister Warren Truss. “A rail line connected to the metropolitan area of Sydney is not essential in that [early] phase” said Mr Truss. The NSW Transport Minister Andrew Constance was more open to the idea, stating that he was “putting all things on the table”, including a possible extension of Sydney Rapid Transit out to Badgerys Creek via the existing Kingsford Smith Airport at Mascot. 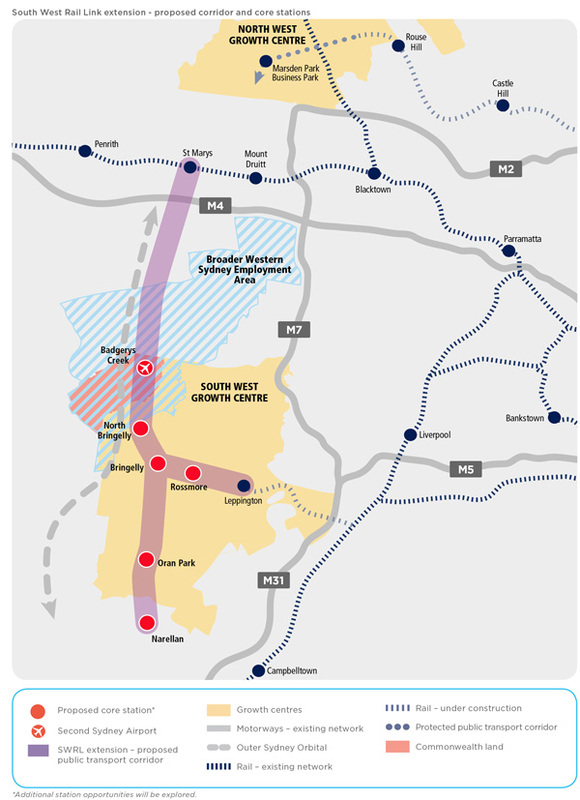 Proposals exist to extend the recently opened South West Rail Link to Badgerys Creek, but there are no current plans or funding to do so. New ticket gates that accept only Opal cards are to be trialed at Olympic Park Station. Existing ticket barriers that accept both Opal and paper tickets will continue to be in use. A new technology is being trialed which detects either spray paint or permanent marker on trains, so far leading to the arrest of 30 individuals. Known as “Mousetrap”, it uses an electronic chemical sensor which detects the vapour of both spray paint and marker pens. Live CCTV records and provides images directly to Sydney Trains staff. Removing graffiti from the Sydney Trains network cost $34 million last financial year, up from $30 million the year before. 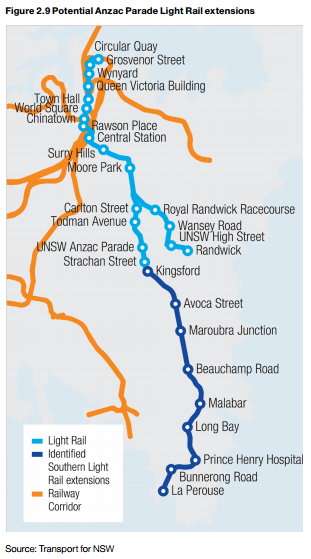 The Epping to Chatswood Line, set to be shut down for 7 months during which it will be converted and connected to the North West Rail Link in order to create the first stage of Sydney Rapid Transit, will be disconnected from the T1 Northern and North Shore Lines prior to its shut down. 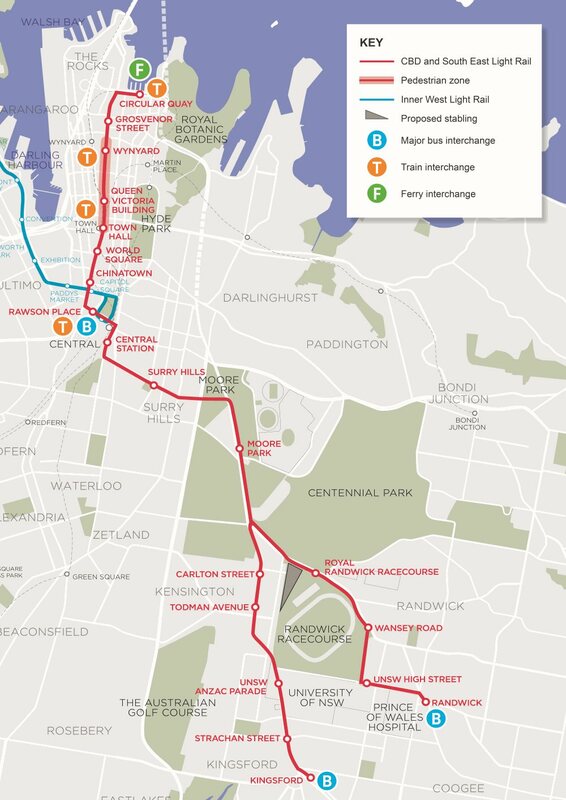 A recently approved government proposal will see the line operate as a shuttle service between Epping and Chatswood for 4 months prior to this conversion, most likely in 2018. A report prepared for the government predicts that 1.14 people will be killed by the new CBD and South East Light Rail line every year on average. Between 2010 and 2014, there have been 3 fatalities involving pedestrians and buses in the Sydney CBD. The report also predicts 1 fatality every 5 years for the existing light rail line to Dulwich Hill, although no deaths have occurred on this line since it opened in 1997. 57 requests for Opal card data, which include the card user’s address and travel patterns, have been granted by Transport for NSW to government agencies since December 2014. A total of 181 requests were made, with no court approval required in order for information to be handed over. By comparison, information from Queensland’s Go Card had been accessed almost 11,000 times between 2006 and 2014. Tunnel boring machines on the North West Rail Link have reached Showground Station. 12km of the 30km of tunneling, representing over a third of the total length, is now complete. The Government is considering the possibility of selling off Long Bay Prison, possibly raising a estimated $400m. The sale, which would see the site redeveloped, has been linked to a possible extension of the light rail line currently under construction. The CBD and South East Light Rail is set to open in 2019, initially reaching Kingsford. However, an extension as far as La Perouse has been raised as a possibility. Internal government reports show that traffic levels on inner city roads around the planned WestConnex tunnels are predicted to be higher in 2026 than in 2011, despite the planned completion of WestConnex by 2023. A spokeswoman for the WestConnex Delivery Authority commented that “[traffic on] the inner south will improve with WestConnex as opposed to a do nothing scenario”. A construction schedule for the CBD and South East Light Rail was released to the public. George St is set to see three and a half years of construction, with the new CBD and South East Light Rail set to be built between September 2015 and April 2018. The line is currently scheduled to open in early 2019, following testing of the line. The Opposition Leader Luke Foley, who recently declared his opposition to light rail on George St, compared the project to the Berlin Wall and declared that it would lead to chaos and confusion. The Government released video (above) of a bus and pedestrian walking down George Street during the evening peak hour showing the pedestrian being faster than the bus. Pedestrianising George St, resulting in the replacement of cars and buses with trams, has been put forward as a way to reduce congestion for public transport users which currently exists in many parts of the city. The announcement also included plans to defer construction on the Northern portion of the Castlereagh St bike path until construction on the light rail line is completed. The Roads Minister Duncan Gay had previously proposed including loading zones along portions of Castlereagh St, which would have the effect of making it a “part-time” bike path. Deferring its construction pushes back the need to make a decision on this issue. However, the existing bike path on College St is set to be converted into a bus lane. This will help to handle bus movements once George St becomes closed off to vehicles, but removes a North-South bike path in the CBD for a number of years. Newscorp is set to discontinue mX, its free commuter newspaper. mX is currently distributed each weekday afternoon in Sydney, Melbourne, and Brisbane; it began in each of these cities in 2001, 2005, and 2007 respectively. Legislation to allow the 99 year lease of 49% of the NSW electricity distribution network has passed the NSW Legislative Assembly. It now goes to the Legislative Council, where a combination of the Liberal, National, and Christian Democratic Parties that have committed to supporting the legislation have enough votes to ensure its passage through the upper house of Parliament. The announcement on Thursday of the construction schedule for the CBD and South East Light Rail has seen the debate over the line re-open. Construction of the George St portion, set to occur between October 2015 and May 2017, will last over a year and a half. Closure of streets during this time will hurt businesses operating in the area. Meanwhile, changes to bus routes and timetables, set to change in October to co-incide with the start of construction, remain a secret to the public. Earlier in the week, the Opposition Leader Luke Foley had declared his opposition to light rail down George Street, while supporting light rail from Central to Randwick and Kingsford. When the construction schedule was announced, Mr Foley said “the Liberals will deliver a Berlin Wall down the central spine of Sydney, dividing the CBD into east and west…Sydney needs light rail – but not down George Street. The Liberals should listen to the experts and terminate light rail at Central Station”. Mr Foley supported the full light rail project prior to the last election, committing to build it in full if elected Premier. The Premier Mike Baird defended the decision to go ahead with construction, stating that despite the disruption “if we say we’re going to build it, we’ll build it”. The Transport Minister Andrew Constance reinforced this view, saying that “we’re not in the business of cancelling contracts”. As we Rebuild NSW there WILL be major disruption. But that doesn't mean we turn and run. If we say we're going to build it, we'll build it. The former Premier Barry O’Farrell, who was Premier when the current project received approval, also criticised Mr Foley for relying on Nick Greiner’s opposition to George St light rail in order to make his case. Mr O’Farrell has previously distanced himself from Mr Greiner, a previous Chairman of Infrastructure NSW, arguing that Mr Greiner may oppose rail based public transport but Mr O’Farrell and his government support it. Sydney is set to continue to grow and that growth needs an increase in transport capacity. For dense areas like the inner city, that means public transport should be prioritised ahead of private motor vehicles; while for the CBD, that means rail needs to be prioritised. When it comes to high capacity, almost nothing beats rail. Right now, that means light rail down George Street and Sydney Rapid Transit under the CBD. That is current government policy. But not if Mr Foley had his way. In his world you not only see light rail terminate at the outskirts of the CBD but also no new funding for SRT under the CBD, effectively killing the project. Meanwhile, Mr Foley went to the last election commiting to extend the M4 all the way into the CBD. He would expand road based transport for the CBD, but not rail based transport. He has it the wrong way round. 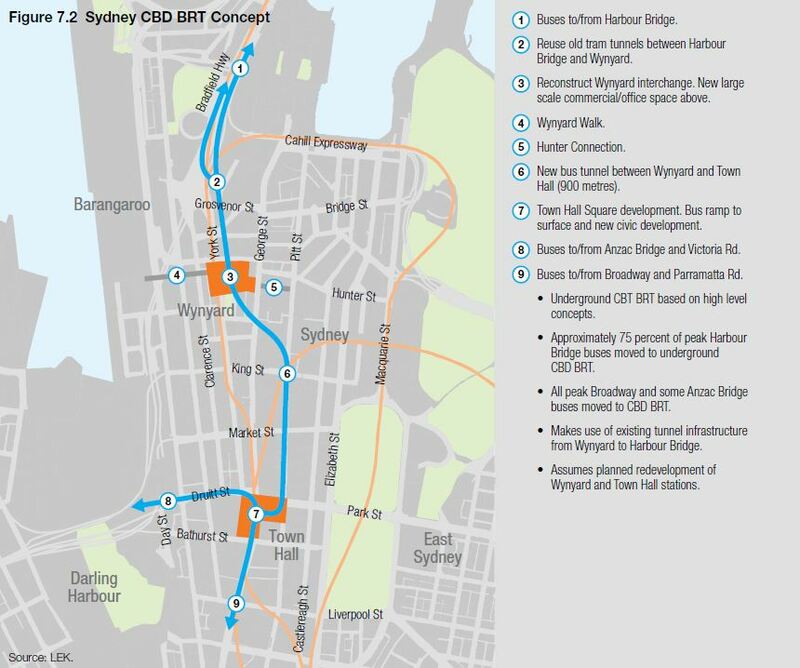 Compare this to the government’s plans for WestConnex, bypassing the CBD and connecting the M4 and M5; with future plans for a Western Harbour road tunnel to connect Rozelle to North Sydney, further bypassing the CBD. Add this to the previously mentioned 2 major rail projects for the CBD and you get the right solution: cars out, trains and trams in. A new light rail line from Parramatta to Sydney Olympic Park could be paid for by raising $2.9bn in voluntary developer levies along the “Olympic Corridor”. The proposal has been raised by the WestLine Partnership, an alliance of business and local government groups representing interests between Parramatta and Sydney Olympic Park. Both the NSW Government and Opposition have committed to building at least one of four short listed light rail lines from Parramatta if they are elected to office. Though a line from Parramatta to Macquarie Park was initially seen as the most likely, a line from Parramatta to Olympic Park is now firming up as the favourite. It was mentioned specifically by Opposition Leader Luke Foley, and has also received the backing of Western Sydney Business Chamber Director David Borger. Planning approval has been given to modifications proposed to the CBD and South East Light Rail Line. Changes include the removal of one stop along George St in the CBD and the relocation of the light rail line to the Northern side of Alison Road, opposite the Randwick Racecourse. The Transport Minister Gladys Berejiklian said “The green light from planning means we can roll out longer light rail vehicles with more seats for customers and 50 per cent more capacity, allowing us to move up to 13,500 passengers every hour”. Construction will begin later this year, and is expected to be completed in 2018, with the line opening in early 2019. The Christian Democratic Party’s leader Fred Nile has added conditions to supporting the 99 year lease of the state’s electricity distribution assets. Mr Nile has demanded that workers rights be protected, seeking that “There would be no sackings for five years [and] their existing conditions and superannuation arrangements must be guaranteed”. The Coalition, which is seeking to lease the assets in order to go ahead with its $20bn infrastructure plans, is not expected to gain an absolute majority in the NSW Upper House and will likely need the support of the CDP in order to do so. Infrastructure Australia has given WestConnex, the proposed 33km surface and tunnel freeway connecting the M4 and M5 freeways in Sydney’s West via Sydney’s Inner West, the green light. IA found that WestConnex would provide $1.80 in benefits for every $1.00 spent, although this is less than the $2.55 that the NSW Government claimed it would provide in a 2013 report. However, the report is based on the assumption that no additional car trips will occur as a result of the road’s construction. These “induced” trips were partly responsible for Melbourne’s East West Link receiving a benefit cost ratio of 0.45, compared to WestConnex’s 1.8. The report also does not take as conservative an approach to potential cost blowouts as IA normally takes, potentially understating the cost and thus overstating the benefit cost ratio. Despite this, IA believes that the benefit cost ratio would still be above 1 (indicating benefits outweigh the costs), even if these two anomolies were taken into account. remove it completely and replace it with traffic signals and directional signage. The Meccano Set was errected in 1962 and is not heritage listed, though it is considered a “place of interest” and a Western Sydney icon. Feedback will be accepted until 13 February. Commuters could save $10,000 per year by switching from driving to taking public transport according to a report by the Australian Railway Association. The savings are contingent on not owning a car at all. Smaller savings of $1,700 per year would be possible by maintaining a car, but taking public transport to and from work rather than driving. Alan Davies at Crikey writes more on this topic. 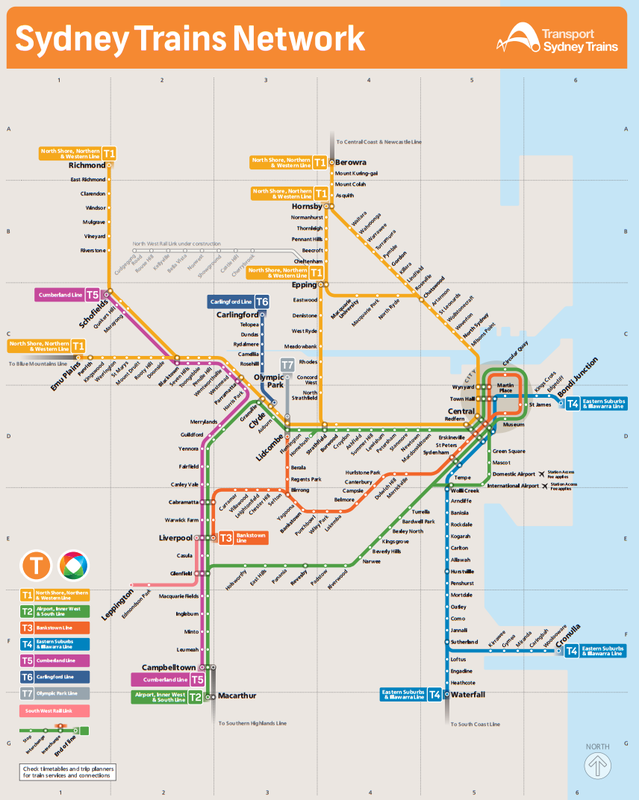 The South West Rail Link has appeared on the network map for Sydney Trains, while the timetable for the line has also been released. Trains will run every half hour between Leppington and Liverpool when the line opens on 8 February. Over 500 new parking spots at train stations were announced or opened this week. 400 parking spaces will be added at Holsworthy Station and 100 parking spaces will be added at Oatley Station. Meanwhile, 23 additional parking spaces were officially opened at Granville Station. The North West Rail Link is running 2 months ahead of schedule and is currently $300m under budget. The news comes as Elizabeth, the first of the 4 tunnel boring machines, reaches the future site of Norwest Station. Elizabeth began digging from Bella Vista, 2.1km away, in September of 2014. New, skinnier ticket barriers have been spotted at Olympic Park Station, suggesting that the current ticket barriers might be replaced soon. The barriers are currently covered up, but are clearly a more streamlined size and shape. Entry/Exit indicators have also been removed from Town Hall Station, which would also support the possibility that ticket barriers are soon to be updated. NOTE: This post was meant to be written for 31 December 2014, but was delayed for numerous reasons. The rollout of Opal readers was completed, some paper tickets were phased out, and we were introduced to Opal Man. Plans for light rail from Parramatta were announced, as were Northern and Southern extensions to WestConnex. These are to be funded by the sale of the electricity distribution network via a 99 year lease. Light rail was extended to Dulwich Hill, while the CBD and South East Light Rail project both its capacity increase (from 9,000 passengers per hour to 13,500) and its cost increase (from $1.6bn to $2.1bn). New intercity trains were announced. Construction began on the North West Rail Link. Badgerys Creek was confirmed as the site of a new airport for Sydney, though a rail line to the new airport will come later. Opal and its rollout garnered a great deal of interest, particularly given the bulk of the rollout occurred during 2014. Most the posts with high traffic were also either original content (Sydney maps: real and fictional or Opal’s hidden gems), or covered specific current issues in greater detail than other media did (Badgerys Creek infrastructure and noise impacts or Metro plan could cost more and Northern Beaches Rail Line in the planning). 11 June was the single day with the highest traffic volumes, with 1,924 views. This was the day after the Asset sales to fund Sydney Rapid Transit post was published. That post was not the most viewed post, but was likely viewed many times on the home page, rather than as a specific post. The 7 December post was in relation to the CBD and South East Light Rail (CSELR), while the 30 March post was in relation to the North West Rail Link. All up, Sydney Rapid Transit was responsible for igniting debate in 3 of the top 5 commented on posts, while the other two were in relation to the CSELR and a future Northern extension to WestConnex. All are projects that are still for the most part in the planning stages, with construction either yet to begin or only recently having begun. The most frequent commenters over the last year were Simon (140 comments), Ray (123 comments), QPP (84 comments), MrV (77 comments), JC (58 comments). Thank you to all commenters for engaging in discussion. Comments are always welcome. Opal was, again, the issue that got readers to share posts from this blog. All up there were 2,651 referrals to this blog from Twitter and 1,971 from Facebook during the past year. Together they represent about 1.8% of all views on this blog. Over 100,000 referrals came from search engines, of which approximately 95% were anonymous searches. The remaining 5% of searches were ll quite different, so similar search terms (e.g. Badgerys Creek airport, Badgerys Creek airport flight path, Badgerys Creek airport noise map, etc) with more than 5 searches were added up. Various combinations of rail maps and Badgerys Creek airport each yielded the greatest number of searches. However, it is difficult to tell if these are a representative sample of all searches. The first half of this new year will see the opening of the South West Rail Link (February), the NSW State election (March), and the start of construction on the CBD portion of the CSELR after the Centenary of Anzac Day (April). Changes to the CBD bus network are also set to be announced during this time. The new year will also see the rollout of Opal Concession cards and ticket machines plus the start of construction on the M4 and M5 portions of WestConnex. 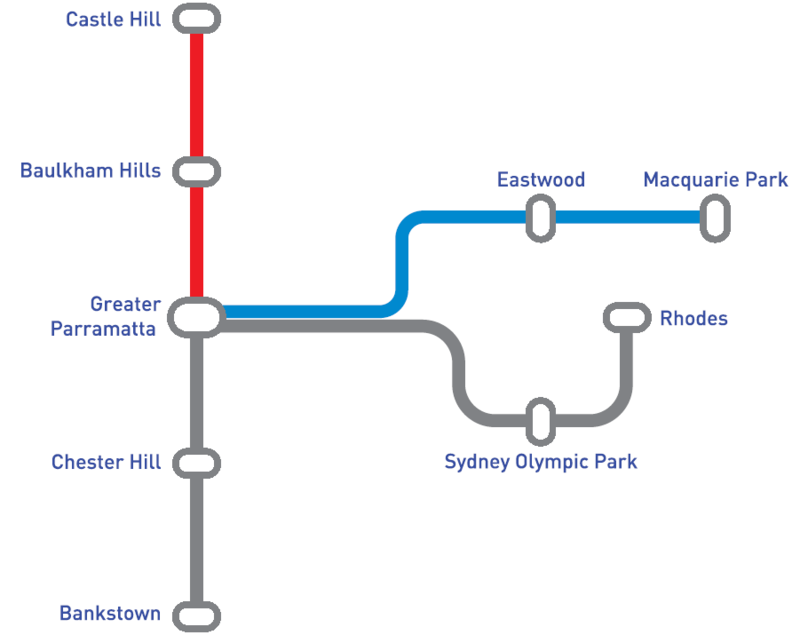 Details are also awaited on which alignment is chosen for light rail from Parramatta and specific information on enhancements to be made to Western Sydney’s heavy rail network in order to expand network capacity once the Epping to Chatswood Rail Link is closed in 2018 to be integrated into the Sydney Rapid Transit network.